To differentiate between the effect of cold and hydrostatic pressure on hormone and cardiovascular functions of man, a group of young men was examined during 1-h head-out immersions in water of different temperatures (32°C, 20°C and 14°C). 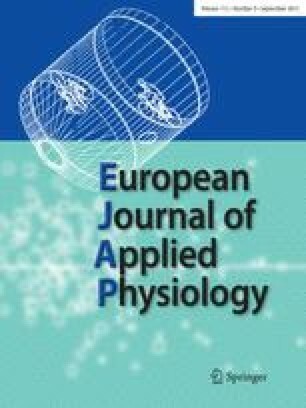 Immersion in water at 32°C did not change rectal temperature and metabolic rate, but lowered heart rate (by 15%) and systolic and diastolic blood pressures (by 11%, or 12%, respectively), compared to controls at ambient air temperature. Plasma renin activity, plasma cortisol and aldosterone concentrations were also lowered (by 46%, 34%, and 17%, respectively), while diuresis was increased by 107%. Immersion at 20°C induced a similar decrease in plasma renin activity, heart rate and systolic and diastolic blood pressures as immersion at thermoneutrality, in spite of lowered rectal temperature and an increased metabolic rate by 93%. Plasma cortisol concentrations tended to decrease, while plasma aldosterone concentration was unchanged. Diuresis was increased by 89%. No significant differences in changes in diuresis, plasma renin activity and aldosterone concentration compared to subjects immersed to 32°C were observed. Cold water immersion (14°C) lowered rectal temperature and increased metabolic rate (by 350%), heart rate and systolic and diastolic blood pressure (by 5%, 7%, and 8%, respectively). Plasma noradrenaline and dopamine concentrations were increased by 530% and by 250% respectively, while diuresis increased by 163% (more than at 32°C). Plasma aldosterone concentrations increased by 23%. Plasma renin activity was reduced as during immersion in water at the highest temperature. Cortisol concentrations tended to decrease. Plasma adrenaline concentrations remained unchanged. Changes in plasma renin activity were not related to changes in aldosterone concentrations. Immersion in water of different temperatures did not increase blood concentrations of cortisol. There was no correlation between changes in rectal temperature and changes in hormone production. Our data supported the hypothesis that physiological changes induced by water immersion are mediated by humoral control mechanisms, while responses induced by cold are mainly due to increased activity of the sympathetic nervous system.